I wouldn’t put it past the state to intentionally screw with liberal Bloomington. Chris Christie did something similar in New Jersey. There is no reason to close 2 of the 3 lanes through Bloomington and cause massive backups. I'd really doubt that. No reason to agitate people before an election and you'd get a lot of Republicans/independents in the crossfire. My read on Bloomington (having lived there) is the type of people who commute on SR37/I-69 every day are the townies or people who might live out of the city and commute to work there. They look more like your typical Indiana resident and probably vote more like your average Southern/Central Indiana voter. The professors, students, and people who live in Bloomington because it's a cool college town live closer to IU's campus or on the south/east side of town and aren't going to go out to SR-37/I-69 every day. I agree, but most of the users of I-95 and the GWB in Fort Lee, NJ are not local residents. Still didn’t stop Chrispy Cream from doing what he did. is it safe to say that they will work on all sections on section 6 up to SR 144 at the same time like section 5 was done? I agree. They don't allow bicycles on interstate highways. The initial work is going to start near Martinsville. Beyond that I'm not sure. they do allow bikes on some interstates, just not in indiana. mostly out west. I drove Section 5 today. All of the lanes were open and the paving and lane striping are complete as well. Work remains to be done in the median and shoulder. Orange barrels still line the road and the speed limit is 45 mph. I haven't seen it myself but my father drove that way over the weekend and he mentions a new mileage sign south of Liberty Church Road with control points of Bloomington, Ellettsville and Evansville. If this is true then it would be the first I-69 based mileage sign I've heard of south of Indy. I'd love to see more signage like this along the rest of I-69 heading toward Evansville. Here's the new mileage/control city sign about a mile south of I-69/Liberty Church Road interchange. Photos were taken Monday, October 29, 2018. Signage on southbound Interstate 69 about a mile south of the Liberty Church Road interchange in Morgan County; looking south. Slightly different perspective; again looking south. And here's a couple on northbound I-69 just a little north of Liberty Church Road interchange. Northbound I-69 signage, about 1/2 mile north of the I-69/Liberty Church Road interchange; looking north. It appears a new, temporary sign will replace the "Freeway Ends" sign. 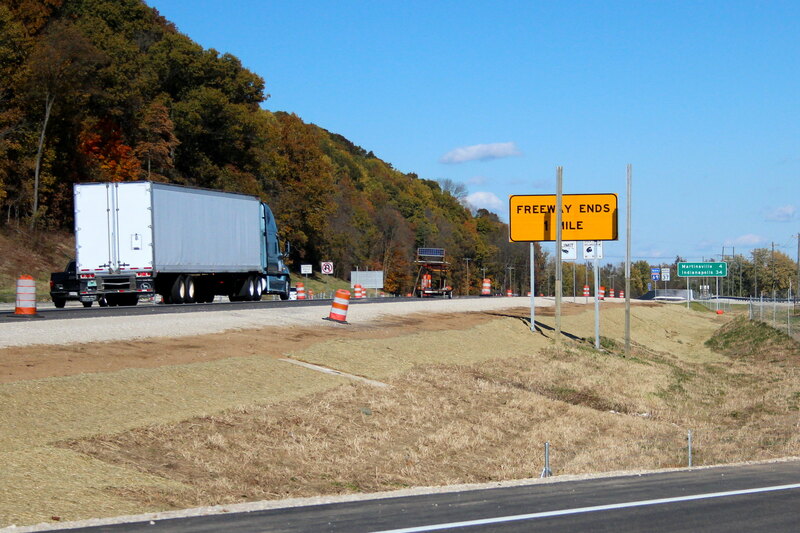 It's also possible the already existing "Freeway Ends" sign will be moved to a higher position on the new posts. Different vantage point. In the foreground is the eastern frontage road which connects into the Liberty Church Road interchange. 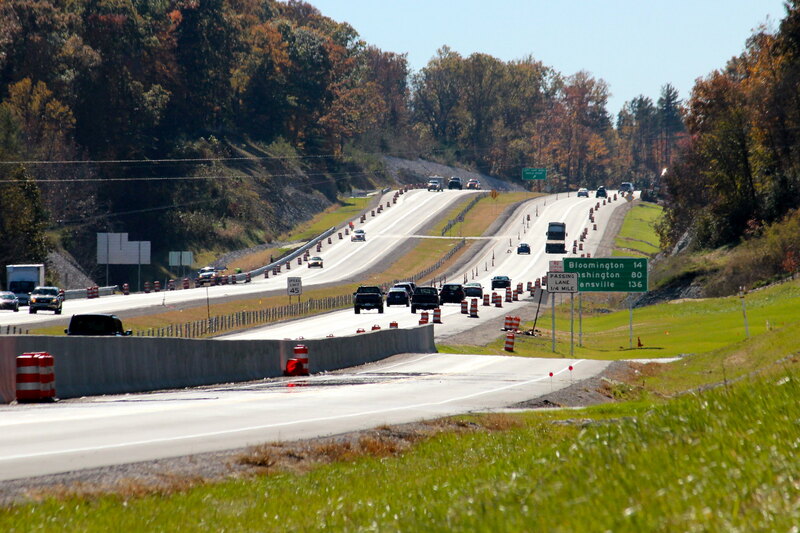 Section 5 is now "Substantially Complete"
Nearly two years after the original target date, it appears the Interstate 69 Section 5 project has reached substantial completion. Substantial completion has become a controversial term in recent months as Bloomington city officials said the state's definition didn't match public perception. 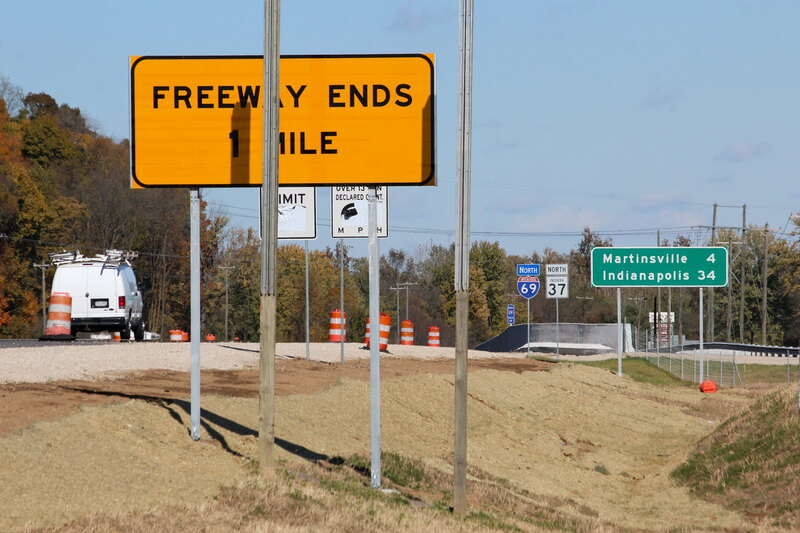 Scott Manning, spokesman for the Indiana Department of Transportation, was hesitant to use the term in a phone interview Monday, but emailed responses to questions about the project seemed to indicate the state now views the project as substantially complete. The definition of substantial completion varies depending on the project, Manning wrote, but "In general, it means the roadway is functional and open to traffic with limited restrictions." Now that Indiana's Interstate 69 Section 5 project has reached its "substantial completion" mark, it's time to turn our attention to Section 6, the last and final construction leg of Indiana's I-69 Corridor Project. As many of you know, Section 6 involves the upgrading of Indiana State Road 37 from a point just south of Martinsville, Indiana, north to I-465 in Indianapolis, a distance of 26 miles. Also planned are 18 miles of new, local access, or frontage, roads. Construction of Section 6 will begin in Martinsville. There are two construction contracts for Segment 1, which covers the Martinsville area. The initial contract, which involves the construction of new local access roads and an overpass, will be let December 12, 2018, with work expected to commence in the spring of 2019. The second, and larger, contract will be let July 10, 2019. 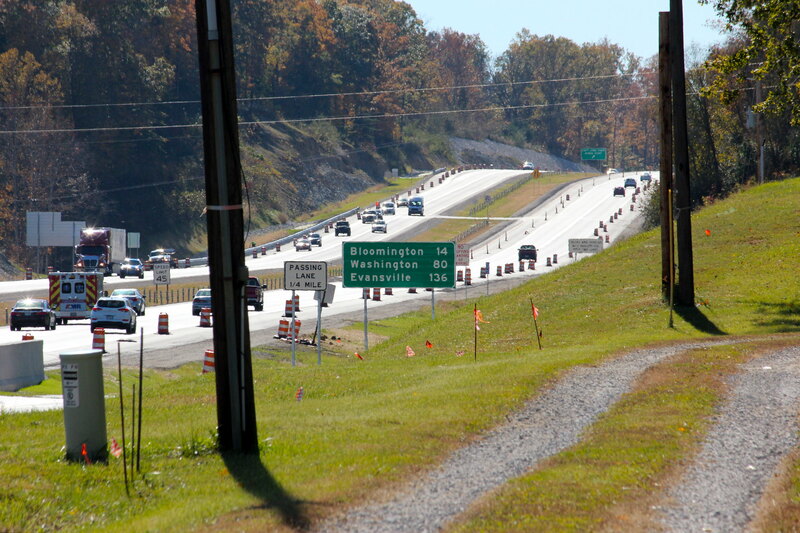 This contract comprises the bulk of the I-69 road and interchange work throughout Martinsville and vicinity. Work under this contract will likely get underway in the fall of 2019, and will then encompass two full constructions seasons—2020 and 2021. During the 2021 construction season, SR 37 throughout Martinsville will be completely closed to all traffic, both southbound and northbound. 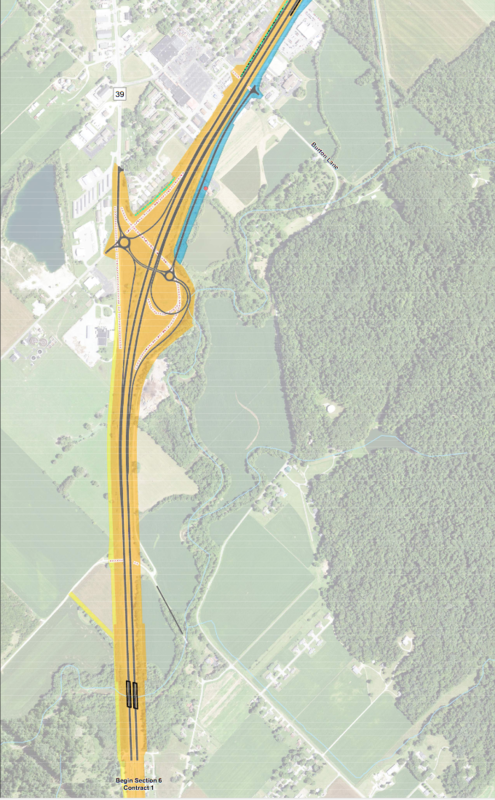 Final design of the interchanges and overpasses, as well as new local access roads, in Martinsville, Indiana, and vicinity. Of note, the final design features several significant modifications to earlier plans. First, the Ohio Street interchange (middle map) will have Ohio Street go under I-69, whereas before it was to go over. The change was due to potential flooding issues. Remember, a little more than 10 years ago, this area of Martinsville suffered a major flood (a picture of that flood was posted in a earlier post of a few months ago). Another modification is the extension of a road from the SR 39 interchange's eastern traffic roundabout to Burton Lane (last map). Also take note that the SR 39 interchange will be completely rebuilt, and will involve shifting the overpass a little south. And, Sartor Ditch, a waterway that runs near Ohio Street (middle map), will be rerouted to run under I-69 north of the new Ohio Street interchange. The new course of Sartor Ditch can be seen as a thin blue line just east (right) of the interchange. 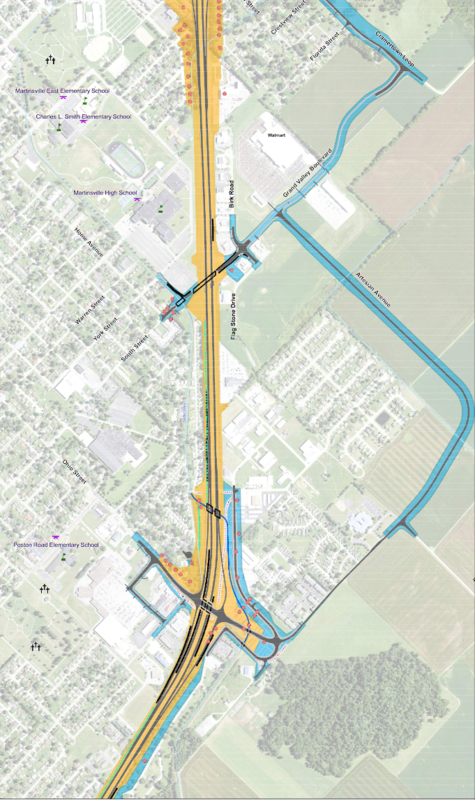 Construction of Section 6, Segment 1, will kick off with construction of the Grand Valley Boulevard overpass, which will connect Grand Valley Boulevard (and the nearby Wal-Mart) to South Street in Martinsville proper (middle map). The new, local access road Artesian Avenue, as well as extensions of Grand Valley Boulevard and Cramertown Loop, will be built in the same time frame. Plans are for these initial projects to complete before SR 37 is closed during the 2021 construction season. It should be noted that SR 252/Hospital Drive will always stay open through the construction work zone, even when SR 37 is closed. A couple of earlier posts have posed questions concerning Section 6 in Martinsville and Morgan County, and I'll try to formulate and post responses in forthcoming posts. I also plan to take some "before" photos in the Martinsville area before construction gets underway. Construction of Section 6 is going to ramp up rapidly. It will be fun to watch it unfold. don't worry no one will go that speed, just like on 465 everyone knows the real speed limit is actually 70. Considering that there's an exit every mile from 3rd Street down to SR 37 that sort of explains a need for a slower speed limit, still it should be 60 or 65. As for widening I-465 from I-70 to I-65, it could still happen. Mann Road to US 31 will probably just be the first phase. I-69 and I-465 was supposed to be done on the northeast side years ago and it only now just being planned out. I am curious about the SR 39 interchange on I-69/SR 37 in Martinsville. When will that be built? SR 39 is supposed to be part of the bypass for traffic around the 37 construction in Martinsville when they close that stretch of highway. So when does the actual interchange get built? I was thinking about those roundabouts at that proposed exit, will they be part of the bypass for traffic to get around the 37 construction in Martinsville? I would hope that they rebuild the I-69/SR37 and SR39 interchange last. Roundabouts are not designed for the traffic volumes SR39 will have while it is a detour for I-69/SR37. I assume there will be no plans to update IN-39 through Martinsville to reach IN-67 prior to the IN-37 closure? I have no problem with closing 37 to accelerate the construction. I have a problem with shoe horning such a large vehicle volume into what amounts as a 2 lane small town road with a left turn to boot. The backups on 67 coming south (to turn left on 39) and 37 going north (to turn left onto the same 39) will be significant. Locals are definitely going to complain about the delays. I already am, as I am on the planned detour path. The least they could do is somehow route the traffic back onto 37. It will probably be best just to bring back the SR 46/I-65 and SR 46/SR 67 detours again that were used for Section 5. At least it will just be one year....we think. Actually, ideally, you'd build a road from the Liberty Church Road/I-69 interchange to SR 67 (or at least to Smokey Rd). 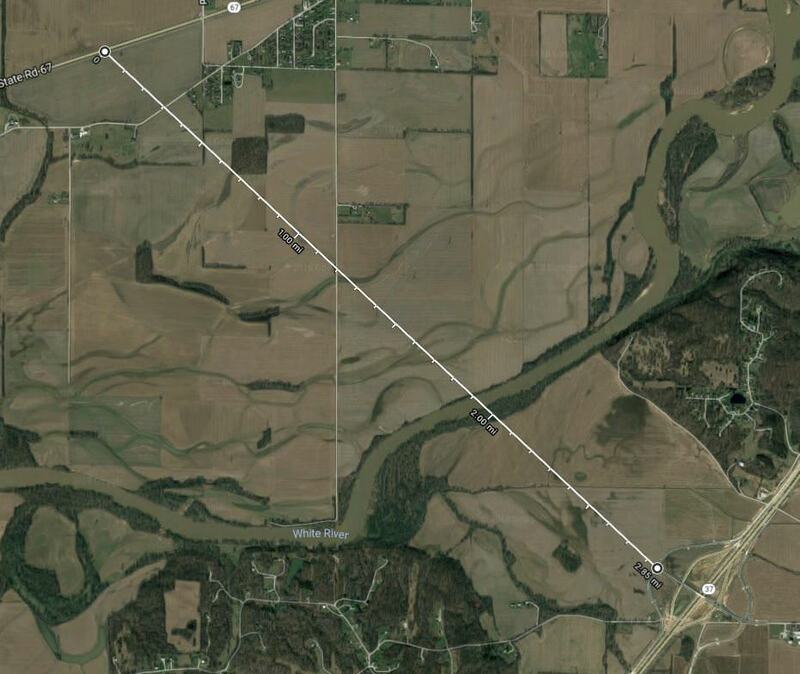 Would need a bridge over the White River, but that's under a 3 mile road and would let people cut through. Until a couple years ago, I-80 through Joliet, IL had been 45 for about 25-30 years. Improvements to 39 will begin in 2020. Will this eliminate congestion? Not a chance, but they aren't ignoring it either. And also described in the links above, the state will rebuild, after 69 completion, some roads which are likely to be severely stressed by the diversions. Generally, it looks like Indiana is being very generous to Martinsville, though there is no way for this to be easy short of a new terrain build around town. If I read this correctly, they are just going to scrape off the surface and put a new layer on. Place new lane striping and reflectors. Place new rail guard strips where IN-39 crosses the ISRR. Retime the light at IN-39 and Morton Ave. This really isn't an enhancement, its just a divide and conquer. People can cut over to IN-67 or drag through downtown and take Old-37 to Morgan Street. Here is what will really happen. People will use Ohio/Poston Road/Garfield Street as a downtown bypass. Just sayin. IN-39 is already 4 lane over the White River. It a divided 2 lane at Morgan Street. Just finish it. 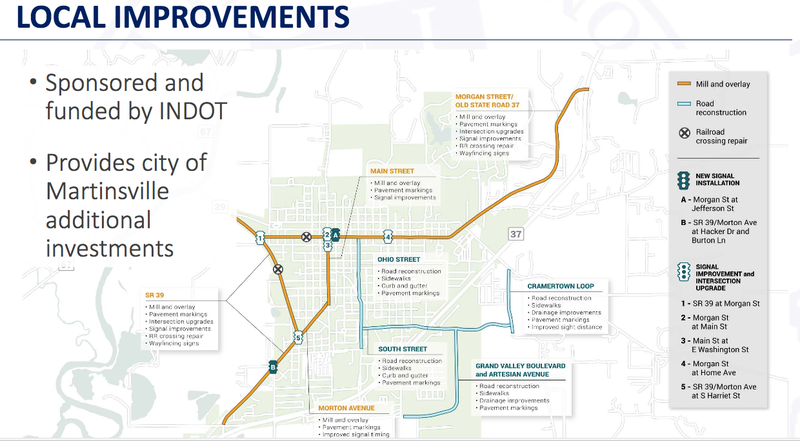 Here's three charts that provide details how INDOT currently plans to manage traffic during construction of the Martinsville segment (Section 6, Segment 1). 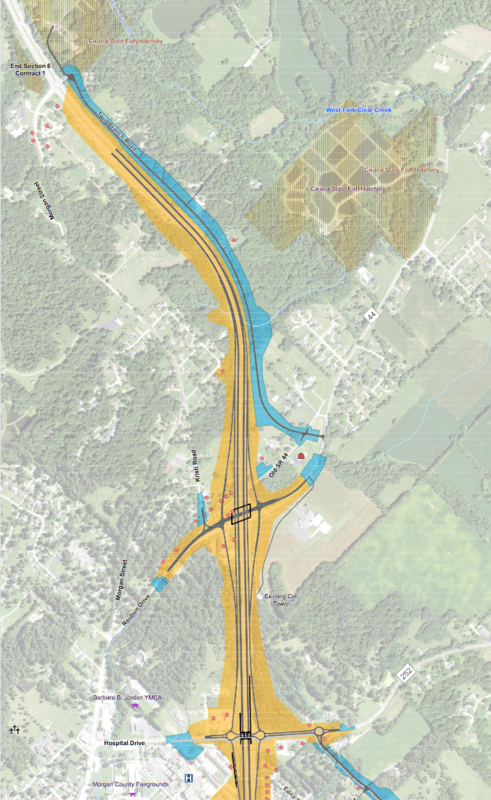 These were part of the I-69 design update presentation at the Martinsville Reevaluation Meeting, which took place September 17, 2018 in Martinsville (link below). To examine the charts more closely, Right Click, etc. The official SR 39/SR 67/SR 144 detour is certainly workable and looks good penciled on a map. 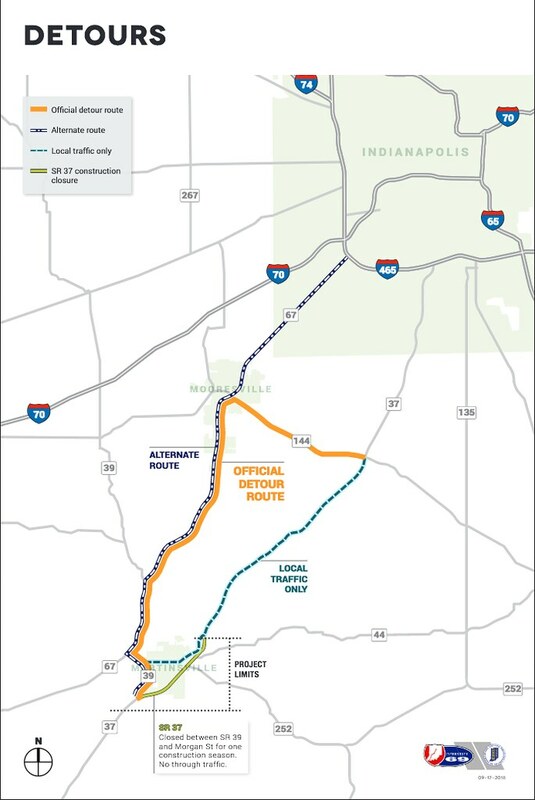 In reality, however, it's a significant detour and may add upwards of 30 minutes of travel time, depending on traffic, for those who regularly use I-69/SR 37 corridor between Indianapolis and points south. For many residents of Bloomington and South-Central Indiana, the detour will be familiar as many take a similar route when they travel to/from Indianapolis International Airport. Since the new terminal was built, this route—SR 37 --> SR 39 --> SR 67 --> Ameriplex Pkwy --> I-70 ramp --> Weir Cook Memorial Drive (the terminal access road)—also has been the preferred way of the Bloomington airport shuttles. The residents of Martinsville and Morgan County who are not going to the airport via SR 67, but are heading to points north, will largely be able to avoid the detour by utilizing Morgan Street in Martinsville to reach SR 37 north of the construction zone. Residents east of SR 37—i.e. in Morgantown, etc.—also will be able to access Morgan Street by crossing SR 37 via SR 252/Hospital Drive, which will always stay open even when SR 37 is completely closed. These folks will have other options as well, such as SR 135, to make their way to points north and south. However, for those who live south of Morgan County and who regularly commute north to Greenwood or Indianapolis, they are going to be in world of hurt. The official detour will add upwards of an hour of drive time for a trip to Indy and back. Before long, these commuters will discover the Morgan Street shortcut to SR 37, and swinging off SR 39 into Martinsville proper will become commonplace. That maneuver may chew up a good amount of time, but for some it might be more palatable than taking SR 67 to I-465, or utilizing the SR 67 and SR 144 detour route. At this time, the focus of the official detour probably is to keep the big rig trucks out of the Martinsville core. If that can be accomplished, traffic on Morgan Street, which may become heavy and congested at times, will be more manageable. There is little doubt traffic management in Martinsville is going to be a major challenge for INDOT, particularly when SR 37 is closed. Bear in mind that during the closure, drivers from Martinsville and parts of western Morgan County that wish to head south on SR 37 and I-69 will find it necessary to use SR 39 to reach SR 37. This means detour traffic on SR 39 will have to stopped periodically at lights to provide access opportunities. That will almost certainly cause backups. 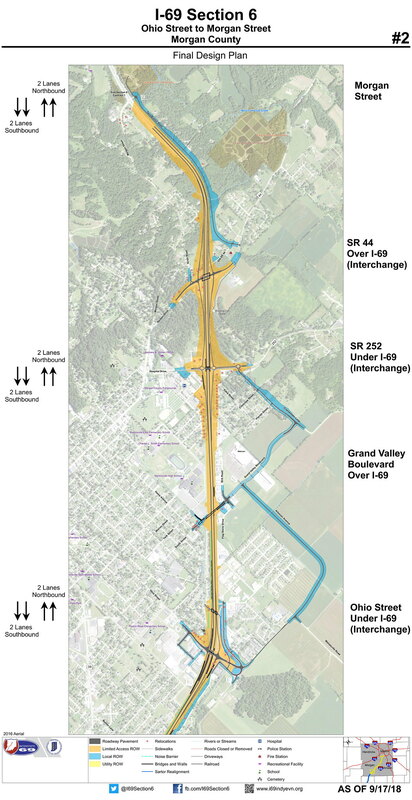 The potential for congestion will become increasing evident during the 2020 construction season, as heavy work commences on the interchanges, and when single lane closures on SR 37 are almost certain. 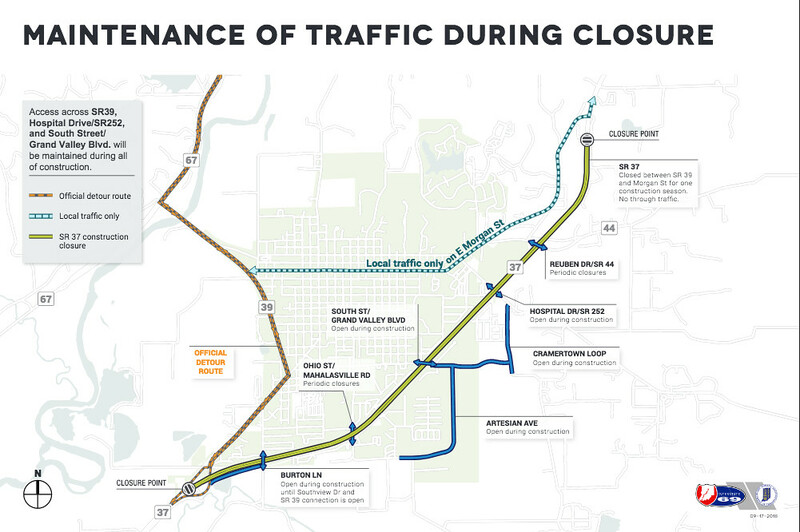 Significant northbound congestion is likely then and many motorists will begin to look for alternatives, with the SR 39/SR 67 detour being among the first to be considered. To be sure, and to speak frankly, it's going to be a mess, and for a considerable period, but viable options to ease congestion are few. To its credit, INDOT appears appears to be working diligently to address potential traffic issues during the staging of a very complex and challenging construction build. Aside from building new bypass roads, which is unfeasible, there is only so much that can be done. *Note: After I wrote the above I remembered that years earlier an airport shuttle on which I was a passenger exited the airport by way of S. Perimeter Rd. to S. High School Road to SR 67. Whether this route is still in use I do not know. At any rate, the airport shuttles from Bloomington utilize SR 39 and SR 67 to reach the airport, not SR 37. The same could be said for any large scale road project. Although just one death is one too many, this project eliminated countless at-grade intersections, including the Tapp Road intersection, the site of numerous fatalities in years past.